Day of the Pig! 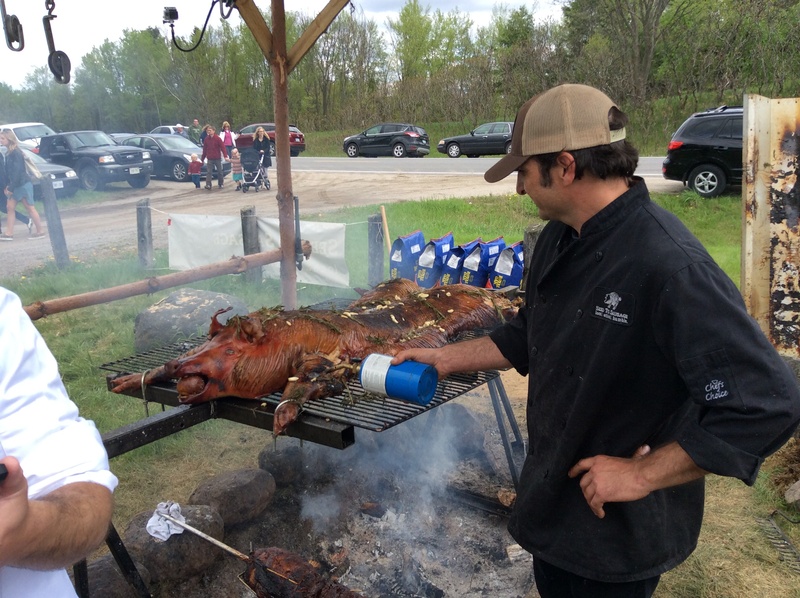 What a great name for an annual festival celebrating everything swine held at Seed to Sausage just north of Kingston. The Day of the Pig started as a celebration of the opening of the Seed to Sausage retail outlet and has grown every year with this being the 4th instalment. 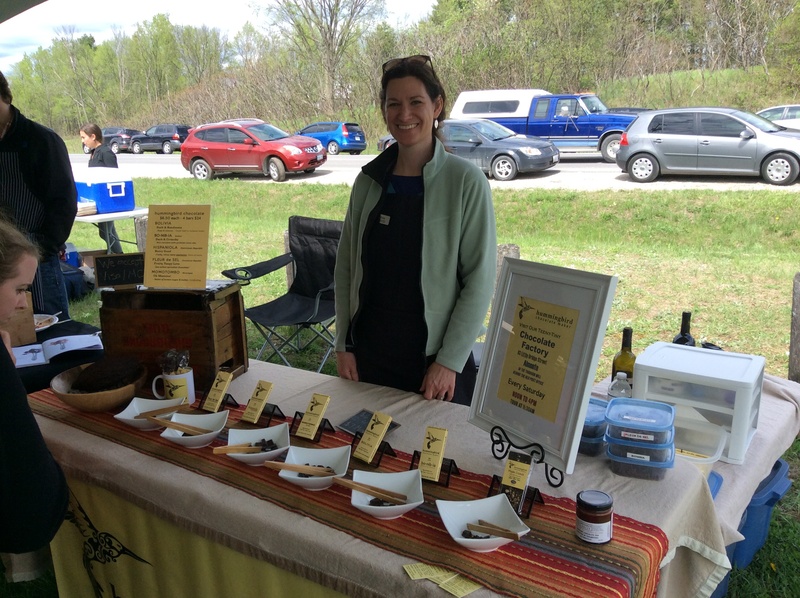 Besides being an excuse to visit my sister, brother-in-law and niece (who live in Kingston), I was eager to attend to submit my signature barbeque sauce in the barbeque sauce competition that was only one of the many events held during the day. My sauce made the finals and finished either 4th or 5th out of 27 entries. Also featured were a number of local vendors in a farmers’ market atmosphere selling various and sundries (!) – handmade chocolate, pastas, baked goods, preserves, sauces, home brew kits, cheeses and fermented products. 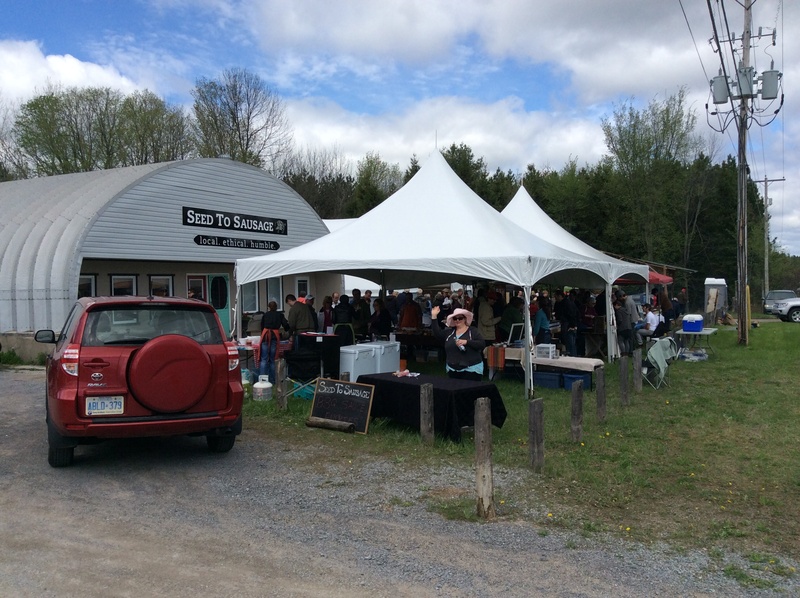 Also on offer were the samples of two wineries and two breweries as well as some food vendors selling tacos, burgers and some delicious smoked salmon sandwiches. The centre piece of the day had to be the whole hog that was cooked overnight. 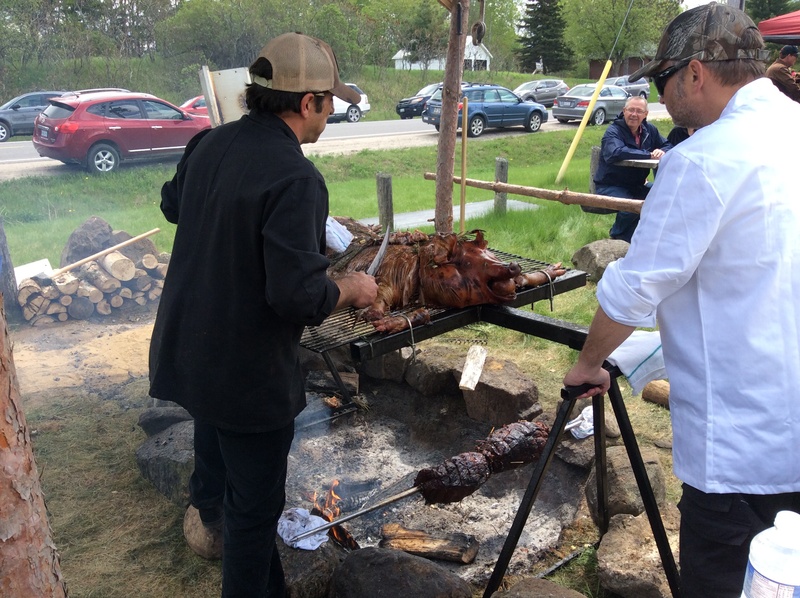 I spoke to the cook who said he used a combination of hickory, cherry and green birch for the smoke flavour. Green birch was a new idea for me, his opinion was that it was essential to give it “some zing”. I patiently waited to get some of the jowls and was not disappointed with the taste or texture. Any seasoned barbequer will tell you it really all starts with the quality of the meat and this pig was glorious! I snagged a large chuck of back-fat that was rendered to perfection and the real taste of pork was simply sublime. I tried to sample all that was on offer and was impressed with the quality of all that was offered as well as the genuine people that were selling their wares. I always take pleasure in talking to the producers that make what they are selling to get a chance to feel that passion they put into their product. Hummingbird Chocolate Maker @HummingbirdChoc had various specific origin chocolates for sample and available to purchase. Owner Erica Gilmour was on hand to answer questions and explain the nuances between each type. Although each was listed at 70% Coaco, the mouthfeel and flavour profiles were vastly different with my favourite being the Momotombo from Nicaragua for the warm sweetness. 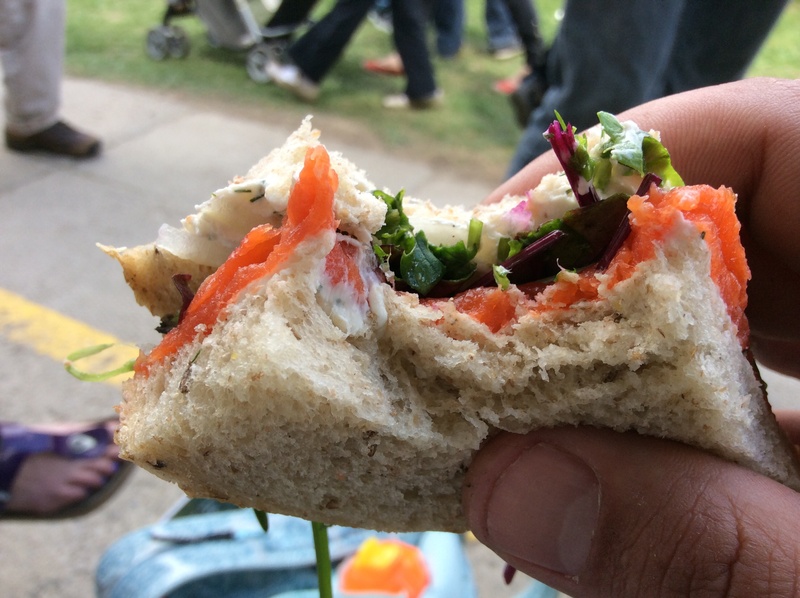 The smoked salmon sandwich from Findlay Foods was outstanding, generous with the salmon and just the right amount greens and sauce. 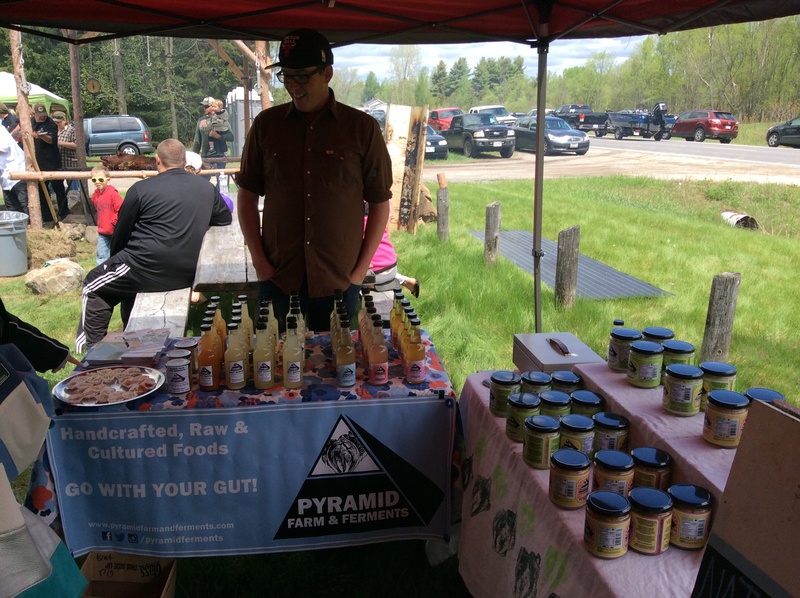 Pyramid Farm and Ferments had some amazing fermented products, a glorious bright kimchi and a product new to me, kombucha, a refreshing fermented tea drink brewed in a similar manner to sauerkraut. Alex Currie, one of the owners, was on hand talking about their products and offering samples. The cheeses from Back Forty Artisan Cheese, similar to everything else I tried at Day of the Pig, were superb. I picked up the Madawaska and Highland Blue and I have no shame in saying I ate the Highland Blue over a couple days all by myself. 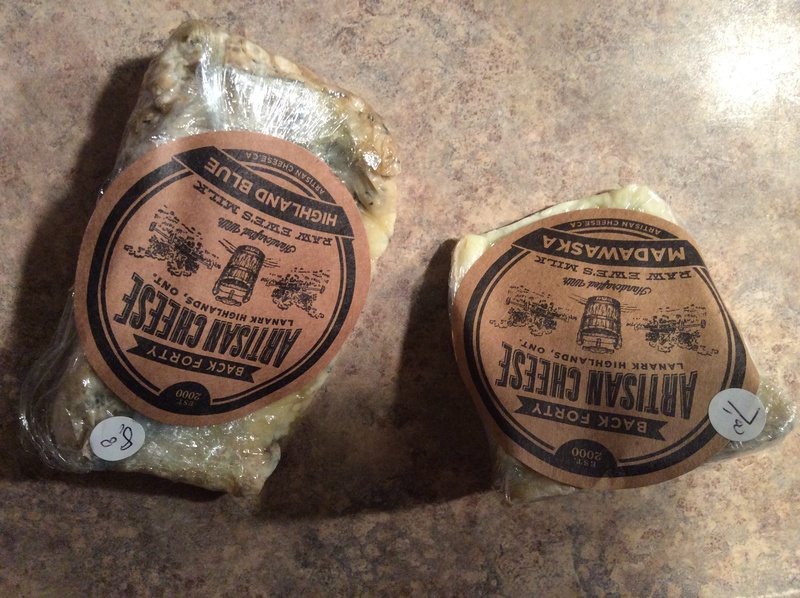 Made from ewe’s milk, it had the perfect balance of salty-pungent-stink that I love in blue cheeses. I still have the Madawaska in the fridge and have yet to open our taste it but I am sure it will be awesome as well. 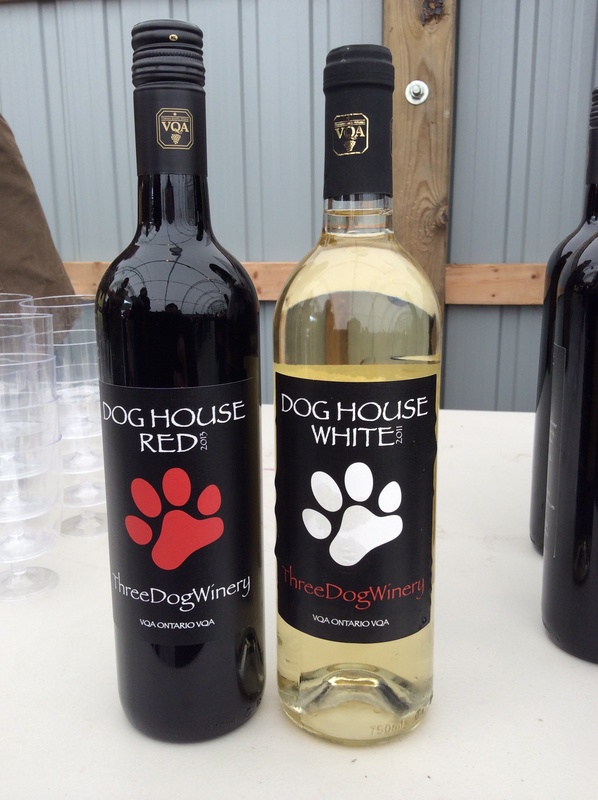 I had the chance to taste all of the wines offered from both of the wineries present, Casa-Dea Estates Winery and Three Dog Winery. Below are my tasting notes. 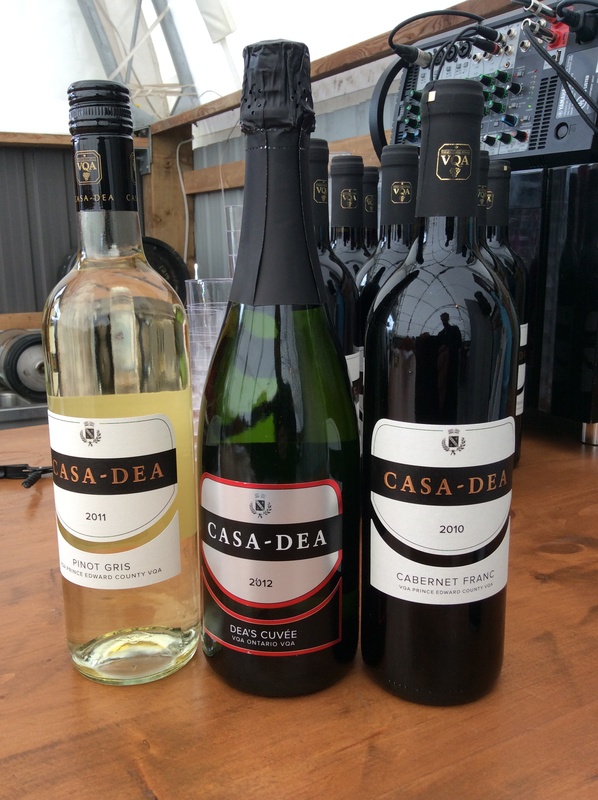 I had the chance to speak with Paul Marconi Vice-President for Casa-Dea Estates Winery about who they are and what they do. All three of the wines they had on offer are LCBO list products and he puts on over 10,000 kms a month promoting their range of products. He also explained why their sparkling wine is labelled as VQA Ontario instead of VQA PEC. Nose of lime and lemon replayed on the palate with refreshing dryness and a hint of tart green apple. Cool and clean with only a hint of a whisper of residual sweetness. A great Summer sipper wine for everyday drinking. Nice expression of the varietal. 100% Estate grown fruit. Charmat method with 60% Pinot Noir and 40% Chardonnay. Dry with very little residual sugar aftertaste. Both nose and palate have very pleasant ginger zing with some lemon pith. Dry and fine mousse with very fine ginger ale-like bubbles, similar to the champagne of the ginger ales that my mom would give me when I was sick with most of the bubbles stirred out. Labeled as VQA Ontario as the method of production did not meet the VQA standards for Prince Edward County designation. 100% Estate grown fruit. Nose closed at first, slow to open up. With some time came fresh red fruits – raspberry, slight cherry (? ), hint of red current. Bistro-style wine that worked really well with the Hispaniola chocolate from Hummingbird Chocolate. Flavours of ripe red current and red raspberry. Integrated tannins, smooth and youthful but very pleasant. 100% Estate grown fruit. Youthful Baco Noir nose of black fruit and bacon. Slightly rough youthful tannins need some time to simmer down. Excellent match for food, great with pork. Fine expression of varietal – a Baco that tastes like a Baco. Palate of black fruit and smoked meat. Dry Vidal with a touch of Riesling, an impression of sweetness on the nose and in the mouth, maybe a little floral touch too. Some tree fruit on the palate, think pear and apple. Nice seem of acidity on the finish. A great summer sipper, perfect for the patio or on the dock. I found a great video on YouTube about the Day of the Pig, I just happen to appear around the 1 second mark! Thanks Derek Cooper for posting! It was a wonderful day and I hope to be able to make it back for the next Day of the Pig!